Enter your details and submit the form above to subscribe to "HDE" our site magazine and newsletter. You will also receive access to your secret members page where you will find some great free stuff reserved for members only. I shall be updating the free members page from time to time so subscribe now and never miss a thing. 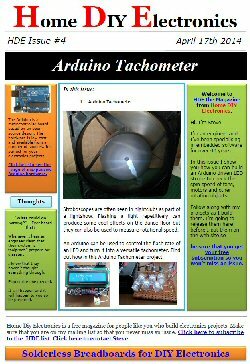 How to build an Arduino based LED stroboscobe and use it as a tachometer to measure the speed of rotating objects. You can measure the RPM of fans, motors, flywheels and even your washing machine. 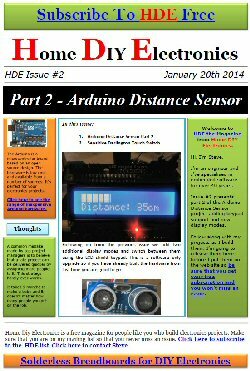 Issue 3 takes the Arduino Distance Sensor project one step further towards a cat deterrant to stop animals pooping in your yard. 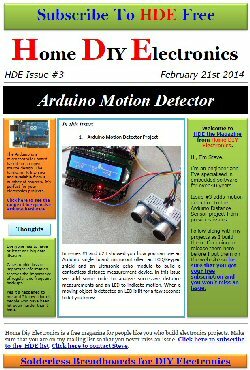 The Arduino project from issues #1 and #2 is upgraded with motion detection software that works just as well in bright daylight as it does at night thanks to the ultrasonic sound echo module used to detect objects. Following on from the previous issue we add two additional display modes and switch between them using the LCD shield keypad. This is a software only upgrade so if you have already built the hardware from last time you are good to go. Also in this issue: An update to the single transistor touch switch project. By adding a transistor to form a Darlington Pair configuration the circuit can be made 100 times more sensitive. 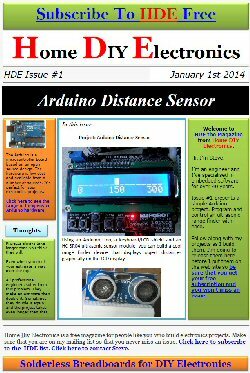 The first ever issue of HDE magazine features an Arduino based distance sensor project. Using a few inexpensive parts you can build an effective object sensor and see the results on a radar type display. The whole thing should take you less than an hour to put together. The distance sensor software will be developed and extended in future issues to provide alternative displays and motion detection capability. Start programming the easiest and most capable single board microcontroller board around. The Arduino is the perfect platform for all kinds of simple electronic projects and it's price tag puts it well within the reach of pretty much all of us. 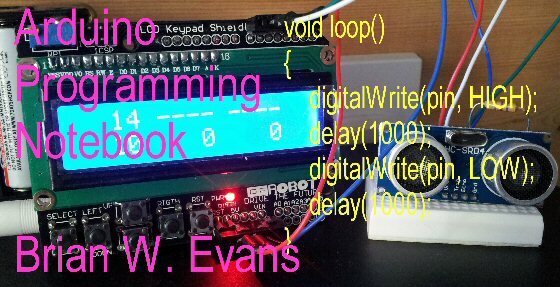 Enter your email in the form above and download this simple to understand guide to programming the Arduino now. What have you got to lose? It won't cost you a penny. Besides reviewing products physically, I read a ton of material - product reviews, manuals, product descriptions on manufacturer pages, product fliers, and industry newsletters. Exposure to such vast amounts of information and to contacts in the industry has provided me some insider information about how manufacturers and retailers push hard to get their products into the hands of consumers. This sometimes includes using online reviewing platforms to make a product look better. One of the largest online shopping destinations is Amazon.com. Their rating and review system provides the social proof consumers like to see about a product when making a buying decision. Believe me - I LOVE Amazon. I make regular purchases through their site, enjoy the vast product selection, appreciate the ability to quickly see what else I might need to go with the item I'm purchasing and, of course, the prices are hard to beat! This book is in no way intended to dissuade you from using Amazon to make any purchases. What I want you to see, though, is how the rating and review process can sometimes mislead you into buying a product that you think is the best but really isn't or how those reviews and shiny star ratings could cause you to pay more for a product than you should. No one wants to do that, right? But if you don't peel back the layers a bit this can easily happen. 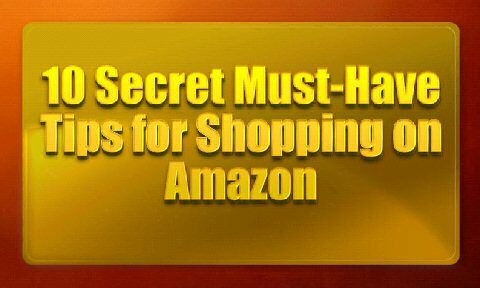 So let me tell you the 10 things you need to know before you buy a big ticket item from Amazon. Armed with this information you should be able to make wise buying choices and perhaps save yourself some money along the way. Despite the wholly inappropriate title, this book is fascinating for anyone with an interest in the properties of electricity or the origins of electronic engineering. The examples are crude by today's standards but then it was written over a hundred years ago. The basic principles are still valid today however (well most of them are). You should note that this book comes with a warning which I reproduce below. WARNING: This book of one hundred years ago describes experiments which are too dangerous to attempt by either adults or children. It is published for historical interest only. You would be wise to heed the above warning as the book does contain some experiments that would not be considered safe today. That being said, I remember some of the more dangerous experiments being conducted either by students or by teacher demonstration when I was studying physics at school. If you don't have what you need to hand why not make it yourself? Written in 1898 the book describes how you can make many electrical components and apparatus from stuff you might find around the house. The book is a a compelling read and might even inspire you to try your hand at making something too.